It's hard to believe, but I have results to post about my project on the day that it's due! Woo Hoo! 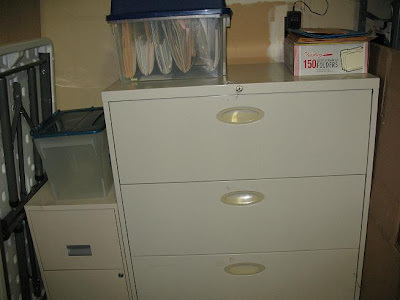 2 weeks ago, you saw the before pictures of my filing cabinet project. Not a fun project to work on and not one that would beautify my house in a decorative sense, but one that would beautify in a streamlined, organizational sense. Now, had I shed my procrastinator ways, I would have realized sooner than *ahem* yesterday that this was such a huge project that it should be multi-phased. I have decided there are 3 phases. And after more than 8 hours (yeah, seriously) of work, I did complete Phase 1!! 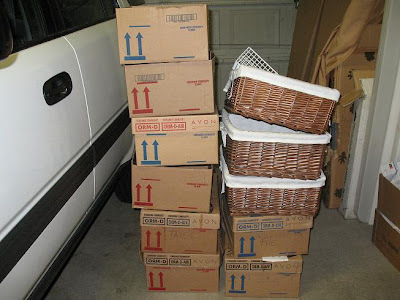 Phase 1: Empty and sort all boxes/bags of paperwork in house and garage and get them into file cabinet in hanging folders. DONE! Look at me, acting all organized - LOL. I have to do that to keep myself accountable. I think this project will actually get finished. What a relief!! OK, you want the pics as proof - I know. I came up with this much garbage! All this stuff needs to be shredded. We have a shredder, but I haven't decided if I want to risk burning ours up or take it all to a local company that shreds it in a couple minutes for $10 per box. It would take me a loooong time to shred all that doing it 4-5 pieces at a time. And there's that beautiful file cabinet!! Not gonna show you the inside, but there are lots of hanging files and a few things stacked up on the sides and in the bottom. That will all be taken care of during Phase 2! I feel SO much better having that done and actually look forward to finishing it. It's nice to have it all in one place and I did clear some space in the garage and quite a bit of space in a spare room closet, which is great. Yay for procrastinators getting things done (even if it all happens at the last minute, as with me!)!! Thanks Melissa for forcing me (she even cracked a whip at me on twitter, though she did offer chocolate at the same time) to work on this project!! How did your project go? If you didn't participate, are you motivated to start a project now? Go check out all the results (or excuses) at the Project Procrastinators Party! I've linked this up to Your Life, Your Blog over at Real Life. Link up your favorite post from the previous week! And Cake Week starts Monday! I think we all could use some cake as a reward! 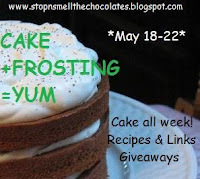 Get ready for some great recipes and get your own cake posts ready to link up here next Wednesday! Wow, great project! I'll be back for Cake Week, sounds like fun! I bookmarked it. Thanks for stopping by my blog! Wow! You must feel so good following that big project. I hope you celebrated with something chocolaty! You deserve it! You did one of the most dreaded jobs of all. But boy does it feel good when it is done. I sometimes think 'oh my gosh, if I died, I would be so embarrassed up in heaven when everyone sees my disorganization and messes. One day. Maybe you will by my muse. My project was practical and needs just a tad more work, some fabric is hiding in my disorganization. You did done a good job. Yuck! Paper work. It's like a weed isn't it? 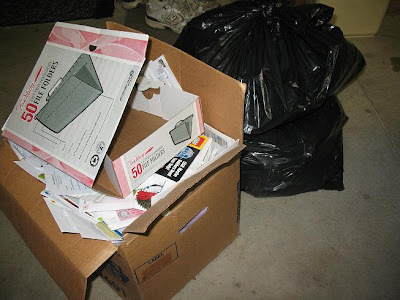 As far as the boxes of stuff to shred, I say burn it. We burn our stuff if it's that much. Big -really wanted to see the inside of the cabinet- size hugs to you my friend. Looks good! I need to do that myself. I hate papers!!!! Glad to hear that someone is organizing theirs. 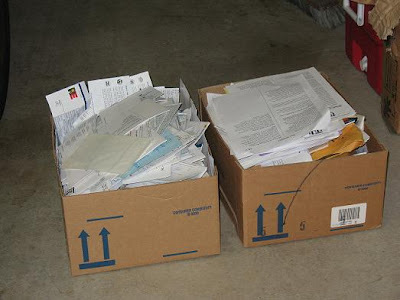 I have boxes of papers from my MIL. She passed away 4 years ago & we still need to go through them. I like the idea of taking to a company that shreds everything for you. Thanks for the tip. Here's to you getting phase 2 & phase 3 done by your due dates. Now go do something fun, preferably something that involves chocolate! Organizing paperwork is such a nightmare! Good for you to getting it so very nearly all done. Cake week? Oh my! That sounds like fun. Knock knock, coming by with some CHOCOLATE! Good job for getting started! I did a lot of that during our move! I wish I had thought of the shredding in bulk for $10. I sat on the floor for hours shredded stuff. Doh. Live and learn. I still have two file drawers filled with, well, MISCELLANEOUS. I really need to take some time to file it away or get rid of it. Oh wow! Good for you! I am so impressed, particularly because this is what I need to do. Hopefully once school is over in 2 weeks, I can get working on it. Hopefully, I can get it done too! Maybe I'll promise myself some chocolate! YOU DID IT!! What an amazing accomplishment! The key to keeping this up is to make sure the system you set is both easy and accessible. You may want to consider scanning as an option as well. I love organizing. There are so many things you can do to simplify things for yourself. Good luck with your schedule. I have no doubt you'll make it.